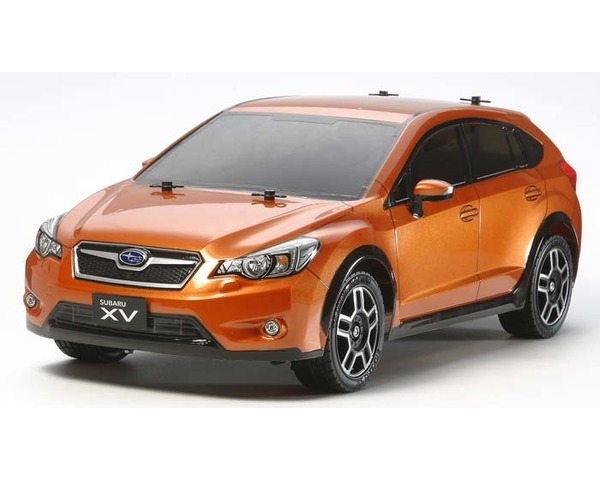 This is a fully factory assembled and ready-to-run R/C model of the Subaru XV crossover passenger car. This item is also available as a kit for those radio control enthusiasts who prefer to build and finish their creations. The Subaru XV crossover passenger car is mated to the highly popular and easy to maintain and upgrade TT-01 Type ES chassis platform. The TT-01ES features fully independent double wishbone suspension for easy parking lot running and thanks to its 4WD drivetrain its easy for the beginner to drive and maneuver. TT-01 ES models are streamlined versions of the regular TT-01 Type E models as they use a less expensive tire.